“Money, it’s a crime. Share it fairly but don’t take a slice of my pie. Money, so they say, is the root of all evil today.” These lyrics are from the Pink Floyd song Money and show a common misunderstanding of the bible really says about riches. Is money the root of all evil today? The book of 1 Timothy is written from the apostle Paul to his young protégé, Timothy. This letter contains helpful tips, encouragements, and what to look out for when leading the Lord’s people. One common theme is the topic of “sordid gain” which is mentioned in reference to the qualifications for leaders in the church that are included in this letter. Sordid gain is trying to receive riches through evil intent. This evil intent would be to use godliness as a means to satisfy the flesh’s greedy desire to get rich. In verse 3 of chapter 6, Paul begins to describe what these individuals look like who are pursuing godliness as a means of getting rich. He calls them conceited who know nothing. They are individuals who teach strange doctrine and they are not willing to listen to the sound words of our Lord Jesus and the true ways of godliness. These people are not peaceful and cause strife, dissension, and envy within a body of believers. The drive of their intentions is to gain wealth. Paul describes how these people think and desire in verse 3 through 10 with terms like, morbid interest, depraved mind, who suppose godliness is a means of great gain, who want to get rich, love of money, and longing for it. When Paul uses terms like these he is exposing the heart attitude of these people or in other words, what their desires are. Notice these are things we cannot see but exist within a person. These are the desires that produce envy, strife, jealousy, dissension and a lack of peace. Paul doesn’t discourage wealth in that he says godliness can be a means of great gain when accompanied by contentment in verses 6 through 8 of chapter 6. If the basic needs of life are meet, then Timothy and his flock are already wealthy. This is a great thought for Timothy to pursue in guiding his flock into true contentment. Marrying this thought up with the fact that pursuing godliness, or Christ-likeness, can start with the understanding that anyone in Christ is far wealthier than all of humanity combined. 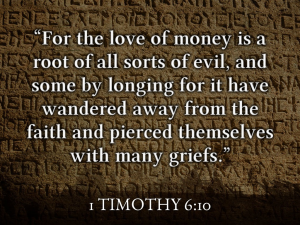 Love of money in verse 10 actually translates one Greek word. The Greek word is, “philarugia.” Another word that can be used to translate this word is greed. One can say that greed is a root of all sorts of evil. Greed is what is being described as the primary motivations of these false teachers. After reading this letter in his own language, Timothy would have understood that using godliness to feed greediness is deadly and will lead to destruction. How do we apply it today? This letter was written from Paul to Timothy almost 2,000 years ago for Timothy to use in guiding his flock. However, the principles still remain the same and we can ask ourselves, “Am I controlled by greed and do I use godliness as a means of gaining things?” Have you been greedy for anything and how did that change your perspective on things? Were you willing to compromise truth in order to gain what you felt would feed what you were greedy for? Did it disrupt others and cause dissension, factions, envy, and strife? Was there a lack of peace because you were greedy for something. Were you willing to use godliness as a means to gain what you were greedy for? I’m sure everyone can say yes to those questions at some level. Things to be greedy for could cover anything outside of money. We could be greedy for attention, fame, fortune, good feelings, power, prestige, relationships and anything else that we think will make us most happy. Yikes! Anyone in leadership knows these temptations but they are just as prevalent within the body of believers as well. There is power in knowing this truth as we can use this truth to guard our own hearts and pursue contentment in Christ. So, is money the root of all evil today? No, it’s unbelief. Unbelief in God and His ways found in Jesus Christ will only lead to destruction both now and forever. Being greedy for material wealth is a sign of not believing in God. Let’s take Paul’s warning to Timothy to heart and pursue contentment by following and being satisfied in all that God is for us in Jesus Christ.